Most of the digital label roll printers we sell are Microsoft Windows compatible. This means you connect the label printer using the windows driver supplied to your computer, then you can use standard software that you may already have like WORD or ADOBE reader, but these are document sheet printing applications not ideally suited to printing labels on a roll fed label printer. Some of you may have ADOBE ILLUSTRATOR CS5 or ADOBE PHOTOSHOP, INDESIGN, or COREL DRAW or have a tame designer that uses the same to produce your nice original artwork for your labels. These are powerful programs and take a while to learn. What you need is an easy to use label layout and print system for day to day use. 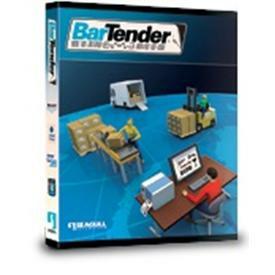 BarTender is the most popular World Leading label layout and print software package. I call it a label layout package as its more important to be able to take an existing artwork say as a jpeg picture, perhaps from you designer friend, and drag it onto a label 'page' and print it. Again 'page' does not normally mean an A4 document but more likely the actual size of one of your labels on the roll. BarTender will let you set the precise label size, for example as 100 mm x 76 mm (or 4 x 3 inches) or whatever size your labels is. Furthermore for full colour labels BarTender will let you set margins around the label size so the picture can be a little larger than the actual label, this we call bleed. Bleed ensures when printing the label printer can completely cover the label with the image and no 'white bits' are left at the edges. BarTender will also provide direct access to the label printer driver so you can check that the settings are correct for detecting the gap between each label or if using clear labels that the setting for black registration mark is selected. If you have the label size and the gap settings correct then when you print say 3 labels as a test the printer should register on the gap (or black mark) and the image printed should be perfectly aligned on each label. Always start with a very simple design, even one word on the label like HELLO, then check that when you print a strip the HELLO is in the same place each time (its in register hooray!). Then you are free to use the power of BarTender to lay out your label by adding pictures, logos, text, barcodes, expiry dates, prices, batch numbers, instructions or whatever is required. You simply drag the items from the top menu bar and place the item on the label. Double click on the item to say change the text or type face, or to search for the location of a picture file on you computer or memory stick. You can set background images and foreground details and change the colour of the items as needed. BarTender Lite is free with many of our printers. BarTender Professional will add many more features ... it will let you add serial numbering so each item has a unique number or barcode or both. It will let you print expiry dates that are automatically adjusted depending on the product shelf life. You can have BarTender ask the user to enter a batch number then the run of labels are printed with that batch number added. You can automate the selection for printing of each days labels needed down to a few moments by connecting your label to a product list you have made say in a MS ACCESS database or MS EXCEL spreadsheet or even a simple text file. Then day to day printing of labels is as simple as adding the quantity needed against items in your product list and pressing the print button, then go and have a coffee whilst all the days label are printed out. We call this label print scheduling. You can download a 30 day free evaluation of BarTender Here just scroll, to the BarTender section. If you would like to see how BarTender particularly works for food labelling with allergen see here.